Dar es Salaam. Oman Air, the national airline of the Sultanate of Oman plans to connect India with Zanzibar in from mid-next month a sign that shows increasing trade and business relations between India and Tanzania.The government has of recent been wooing Indian investors and tourists as part of efforts to catch the gains from a rising global economic giant. The airline will initially operate three flights a week Monday, Tuesday and Saturdayfrom Mumbai, New Delhi, Bengaluru and Chennai to Zanzibar via Muscat. The airline already operates flights from India to Dar-es- Salam in Tanzania. 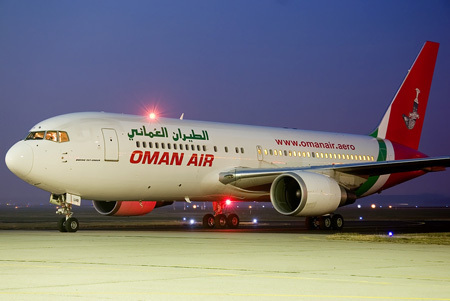 It will be the second international airline, after India to connect Tanzania with the sub-continent.Oman Air, which operates out of 10 cities in India, also plans to start flights from India to Moscow and Khartoum, the capital city of Sudan later this year. Talking about the development Dimuthu Tennakoon, North India Country manager of Oman Air said; “We have witnessed around 20 per cent year-on-year growth from the Indian market, as we keep introducing new routes. Europe and Africa are among the biggest saleable routes for the Indian market. We have started services to destinations such as Paris, Frankfurt and Munich in Europe and Dar-es-Salam in Tanzania and are witnessing good load factor to these destinations from India. We plan to start flights to Zanzibar in Tanzania with effect from May 15, 2011 from metro cities in India from where we operate.According to Tennakoon the airline enjoyed over 80 per cent load factor from India. Commenting on the planned service to Moscow and Khartoum out of India Tennakoon said, “Our services to Moscow were slated to start from summer schedule this year but now has been postponed to the winter schedule. Flights to Khartoum may be delayed a bit and may start by year end. According to Tennakoon, the airline is focusing on its Business Class service in India which it operates on flights out of Bengaluru, Chennai, Hyderabad, Kochi, Mumbai, New Delhi, Trivandurm and Trichy. “We are expecting almost 30 per cent increase in the load factor for our Business Class service and a growth of 20 per cent for our Economy Class by year end,” stated Tennakoon.